Are you rushed for time in the morning? Or are you maybe looking for the perfect brunch menu item? These muffins are the perfect way to eat a full breakfast on the go and also such a great addition to any brunch or breakfast bar. Scrambled eggs are baked into a delicious cornbread muffin and topped with a piece of crispy bacon- talk about a full meal in every bite! 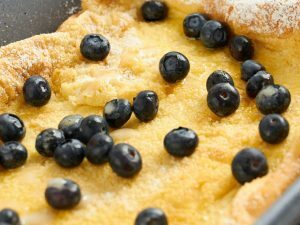 Surprisingly easy to make as well, you must try this recipe and enjoy the convenience it offers for your hectic mornings. Keep about 1 tablespoon of the bacon grease in the frying pan and discard the rest. Crack two eggs into the frying pan with the oil and cook and stir to make scrambled eggs (should take about 2-3 minutes over medium heat). Sprinkle with a pinch of salt and pepper and set aside. In a medium sized bowl, combine the flour, baking powder, cornmeal, sugar and salt and whisk together to combine. Add the milk, two remaining eggs and cheddar cheese to the bowl and whisk everything together until a smooth batter forms. Fold the scrambled eggs into the corn bread batter. Scoop the batter into greased or paper lined muffin trays. Top the muffins with a piece of bacon. Bake in a 350 degree oven for 12-15 minutes or until the muffins are no longer liquid in the center. Remove from the oven and allow to cool in the pan. Enjoy! 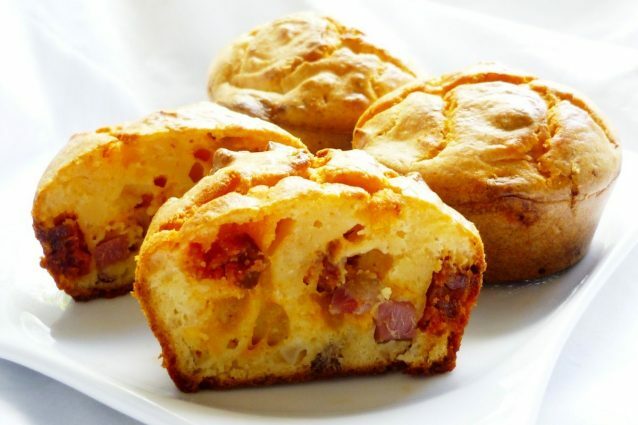 -If you want even more bacon flavor in your muffins, cook and crumble two more strips and fold the extra bacon into the batter along with the scrambled eggs. -Make these muffins into mini muffins that are perfect to pop into your mouth. This same recipe will make 24 mini muffins and the only change needed is to reduce the baking time to about 8-10 minutes. -If you have left over muffins, remember to store them in the fridge as they contain a good deal of scrambled eggs and also bacon, both which shouldn't be left out at room temperature. 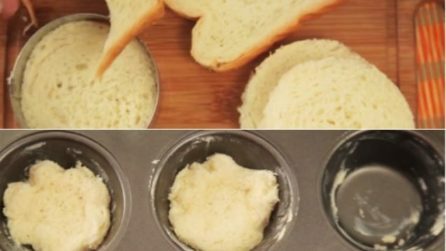 Cut the bread into circles and put it in the muffin pan. The result is yummy! Omelet Breakfast Croissants: two easy breakfast or brunch recipes!